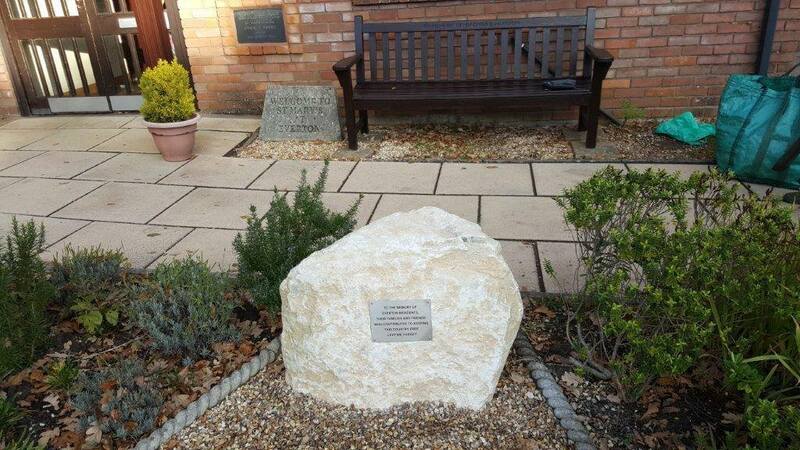 Early in 2018 a small working group, Pauline Breeze, Gordon Pound and Cheryl Fillmore, supported by the Everton Community Association began to consider the viability of providing a Commemorative Stone for Everton. The group’s initial idea focused on a War Memorial, but the group were informed by the Hordle Parish Council that there was a war memorial in Hordle which does in fact cover Everton. Evertonians were always welcome to attend the Remembrance Service held there and in the Hordle Church. Few people were aware of this, probably the result of Everton being in the Parochial Parish of Milford on Sea! However, the group still felt there was a definite need to have some place in Everton where any residents wishing to pay their respects could easily visit and so they set about pursuing the idea of a Commemorative Plaque. They envisioned that the annual Remembrance Service would be held there, and that it would serve as a place for wreaths and poppies on wooden crosses. This service would replace the one held outside the Garage on the Recreation Ground. In addition, during the year, it would simply provide a quiet place for reflection should it be needed. Having looked at various possible sites, only two seemed to be in any way suitable, one the small garden besides St Mary’s Church and that fronts the Church Hall, the other in the region of the Jubilee Bench on Crossways Green. The Church site was more appealing as it offered many more benefits, being in very peaceful and pretty surroundings, close to all the hall amenities (and obviously the Church )and with seating close by. This quickly became the first choice. 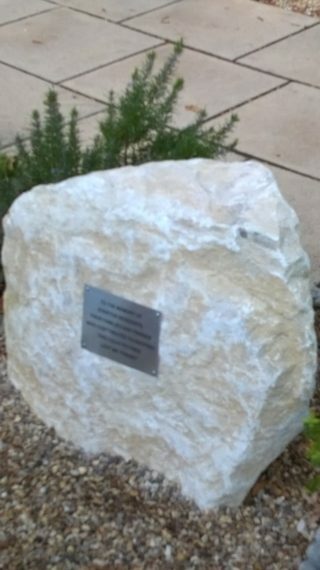 The idea was to place a dressed rectangular stone fitted with a Plaque.This would be visible from the road and on dry land enabling wreaths to be laid. If it was set back from the road it would enable the public to gather around it in safety. The first step was to obtain permission from the Parochial Parish Council who owned the land. Following meetings with Gillian Peard and the District Church Council, permission and support were happily given and received. Things began to fall into place when Toby Sears offered help with the building aspect and Barrie and Carole Morgan offered to fund the Project. 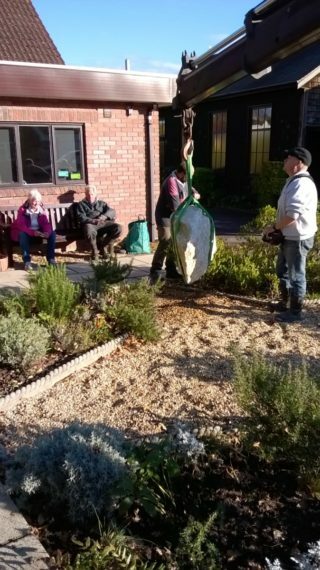 On November 1st the stone arrived and was set in place by Toby Sears and it was immediately obvious that this will be a superb place for members of the Community to gather or to visit alone. 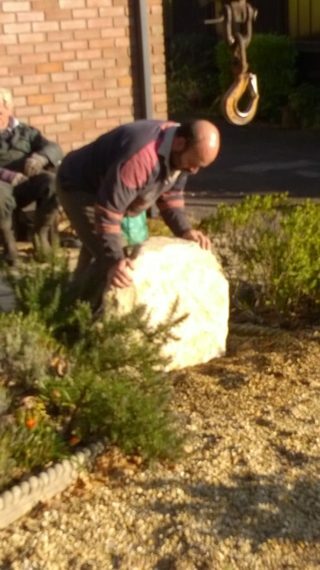 From the moment the stone settled it looked like it rightly belonged! On Remembrance Sunday , 2018, the 2 minutes silence will be observed around the stone for those who wish to be outside but it will also be relayed into the Church so people can be in the Church too. If anyone wishes to place a memorial cross in the area around the stone between now and Remembrance Sunday they are welcome to do so. The crosses cost £2.50 and can be obtained at Friendship Coffee in the Church hall on Tuesday 6 November between 10.0o am – 11 .30 am or at coffee on Sunday 4 November between 11.15. -12.15 pm. They will also be available at the exhibition in the Church Hall on Remembrance Sunday from 10.00 am.